My heroes are not always immediately likable because I create heroes and heroines with flaws they need to work through before they can find true, forever love. 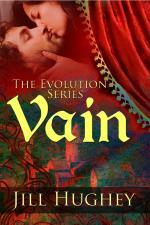 In Vain, the third book in my Evolution Series, Theophilus (Theo) is just that: vain. I jokingly refer to him as a medieval metrosexual because his looks and wardrobe are so important to him. I first met Theo in book one of the series, where he is a bit of a dandy who enjoys a good party. Eight years later, in his own story, he has matured and become jaded by politics and his responsibilities to the empire. His love of clothing brings him into the sphere of his tailor’s daughter, recently abandoned by her grieving father and in need of a protector. Theo exhibits the arrogance of the aristocratic class with Lily while she unwittingly weaves a spell of desire around him. The worst parts of his personality emerge when they are found in a compromising position and forced to marry. He is a resentful groom. (Many readers really don’t like him at this point of the book.) Only after he returns from his summer service to the emperor with life-threatening wounds does he begin to see that what Lily lacks in social position she makes up for with her quiet strength and her ability to show him how to have fun again, instead of leading a life ruled only by duty. In this excerpt from Theo and Lily’s first interaction in the book, Theo has come to Willis the tailor’s shop with beautiful fabric for a tunic. He is also investigating the rumors he’s heard of Willis’s absence from town. Lily needs the money the work will bring and hopes to hide the fact that she has been alone for quite some time, with no idea of her father’s whereabouts. Excitement pulsed in the room. Lily needed this job, yes, but the creativity, the possibility of fashioning the garment that Theophilus described immersed her in an energy she had not experienced for months. She unwound a length of redness, let it drape over her arm. “I see it,” she said simply, because she did. He scratched his ear. “Will Willis have time to complete the garment? He appears to have much business outside the shop.” The pulse diminished. He knew. He knew her father had not been home for days and days. He wanted his burgundy fabric to be worked by the man he thought had crafted his tunics for decades. He also wanted to know where that man had gone. Theophilus frowned. He did not care for that idea. Starting meant cutting and she could see he did not trust her to cut his fine wool. She did not blame him. The price on such a piece in such a color must have been extravagant. “Did you know I helped to make the cloak you are wearing today?” she inquired. “We sewed it three years ago. I remember because we all liked how the blue brightened the worktable that January. And you brought it in last spring to mend a tiny hole on the inside,” she added. “I have worked fabric with my parents since I was a young girl. Father has allowed me to cut for nigh on ten years now.” In reality, Father had demanded she do all the cutting, which suited her just fine. She did not make mistakes, but more importantly, she had a good eye. She could see things in the fabric and the person who would wear it like no one else. Or so Mother had said before their lives unraveled. “Yes, of course,” she said. Did he think that merchants hired out their own work? She ducked her head in pleased embarrassment. “Yes, my lord.” She had been taught by her mother to always regard the man before her as her better, careful to speak and think of him as the Lord of Ribeauville, though with that being such a mouthful she often shortened the title to the lord, or her lord, or my lord. She shied away from even thinking his given name, although her friends bandied it about as if he were one of them. Or, at least, they did when they knew he was not in residence. Her lord scowled. “Well, what did you do?” he demanded impatiently, his eyes not so soulful any more. “Oh,” she breathed as she lifted her fingers to the subtle pleats of the cloth. “I shaped the top to make my shoulders appear broader.” What a humiliating admission! “I do not think so, my lord. But I did not pad my tunic. I added pleats and liked the balance they gave shoulders to hips,” she explained, blushing furiously. Imagine, talking about her body parts with her lord. “Yes, my lord. I swear it on…on the Blood of Christ!” she finished, laying her hand on his bolt of fabric possessively. Vain – A tailor’s abandoned daughter fashions a vain nobleman’s tunic, finding passion between the neckline and hem as misfortune forces her into his precarious aristocratic world. About Jill Hughey: The most interesting fact about Jill Hughey is that she can sing really, really high. As in opera-singer high. But she only does that when she is not writing, working part time as a business administrator, running her two teenaged sons around, and enjoying the support of her wonderful husband. Her ideal afternoon is spent sitting on her front porch with an iced coffee as she moves the characters in her head into her laptop. Happy reading! You can find Jill on Facebook at www.facebook.com/jillhugheyromance, at her blog at http://jillhughey.blogspot.com, and on Twitter at www.twitter.com/jillhughey. It’s great to be here, Leanne. Thank you for letting me visit with you today!